At age 4, Jackson Thorne was very specific about the foods he would eat. On his rotation were chicken nuggets, tostadas, beans and chips, and a specific pasta dish that his mom made. Plus, his food needed to be hot or he wouldn’t eat it. For his parents, Michele and Matthew, it was extremely stressful. “At the time, he only went to preschool for a half-day, so I was able to bring him home and heat up a lunch for him. But, kindergarten was approaching and it would be all day. I didn’t know how we’d be able to get him to eat or what I could send for him,” Michele says. As a baby Jackson had developed typically until he was approximately 18-20 months. At that time, he had about 10-12 words. Suddenly, he stopped talking almost completely. At age 3 ½, he was diagnosed with autism. Searching for resources and help, the family attended an autism fair in the Phoenix area. There, they met representatives from Southwest Autism Research and Resource Center (SARRC). They immediately became involved in the organization. The family went through SARRC’s JumpStart program about jumpstart session , which Michele says was invaluable. JumpStart also taught the Thornes about Pivotal Response Training (PRT) and how to apply it. “That was huge for us,” Michele says. After JumpStart the family enrolled in SARRC’s Comprehensive Behavioral Program (CBP), a comprehensive, highly individualized ABA program. One of the goals? Having Jackson expand his food repertoire. The Thornes had tried food therapy through a speech therapist prior to working with SARRC, but it was unsuccessful. SARRC was determined. 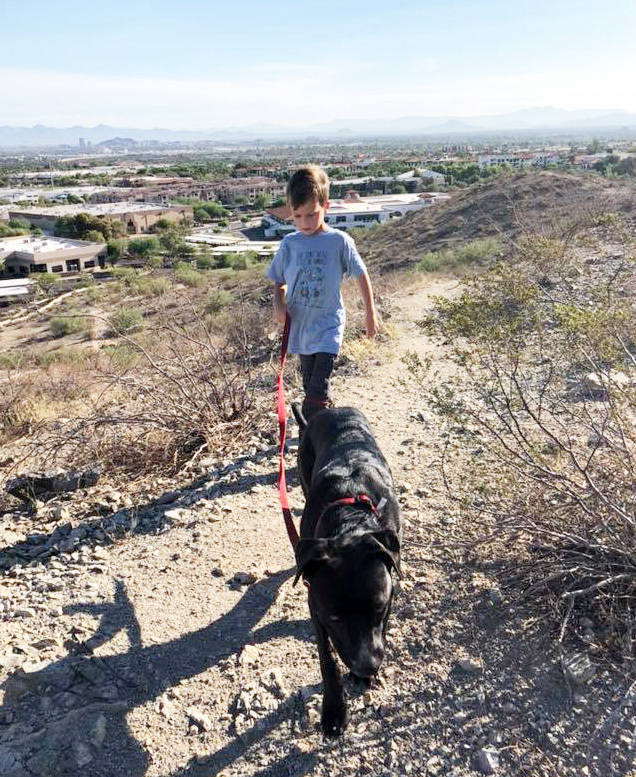 The CBP therapists tried various approaches, modifying different methods and incorporating the Thornes’ input, until they found a program that worked for Jackson. Today, at almost age 6, Jackson has added a few foods, including Lunchables, to his diet, and is more open to trying something new. “What we do now is that he is presented with two different food options of what he can try so that he has some level of control. He then has a step-by-step process of what he does. He licks it a few times, then gets his reward (some time with his iPad). A minute later, he has to lick it a few more times and then take a tiny bite, then he gets his reward again. Next, it’s a few tiny bites. We repeat the process until we work up to a big bite,” Michele explains. Although it took a while, Jackson will now go through the steps without complaining. Jackson also was able to start kindergarten and bring a lunch that he’d now eat. Another aspect he works on with SARRC clinicians is communication. Jackson was also diagnosed with apraxia, so he struggles with his brain telling the muscles in his mouth make the correct sounds for speech. He now has an augmentative communication device, and he can produce full sentences that communicate his wants and needs. Though it is still a journey, Michele says that the progress Jackson has already made with SARRC’s help have made such a big impact. “We do a lot of camping as a family and it’s always been so stressful because I think, ‘What am I going to feed him?’” Michele says. “Then, I was in the grocery store recently and I almost cried when I realized that I can bring him a Lunchables. So we did recently and he loved it. “He can also now sit with us sometimes at dinner. It’s been a really great change."